Our brown eggs are laid Red Stars, Amber Links, and Isa Browns. 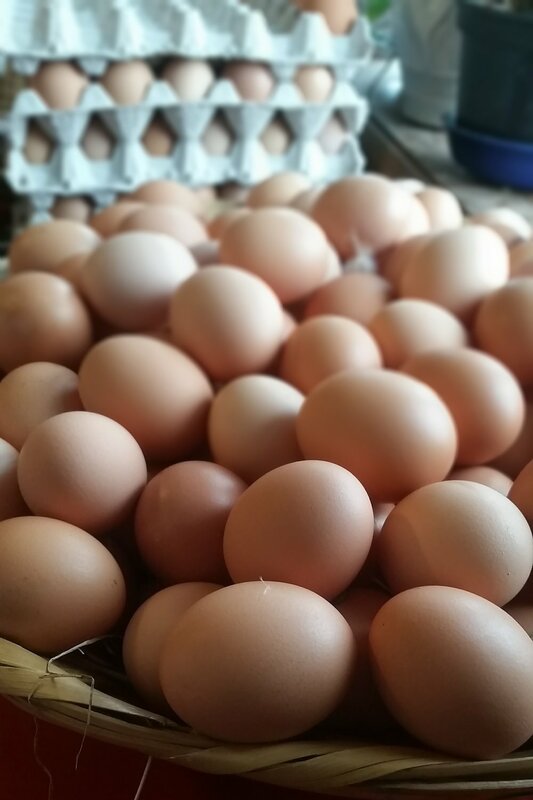 Our eggs are available year-round for $6/dozen. You can buy them on-farm (call ahead) or at Argus Farm Stop (Liberty location only). We process our heritage hogs once per year in the late Fall. We sell whole/half hogs for $3.25/lb hanging weight (plus processing fee). We have whole/half lambs available at least twice per year for $3/lb live weight. Lambs are sold between 9 months and 2 years of age but you are interested in hogget or mutton instead, let us know. We deliver your live animal to a local custom processor and you pick it up directly from them and pay their processing fee. Thank you! When we approach the next slaughter date we will be in touch. The original product that gained Salomon Gardens such devoted customers were our broilers: Freedom Rangers—a hardy, foraging bird, with more flavor, denser meat, and smaller breasts than a typical commercial chicken—-raised on pasture. In 2017 and 2018 we didn’t raise any broilers, but plan to start back up in again in 2019. When we have details sorted out on how to purchase, we’ll post them here. Thank you! We will have more information by April 2019.